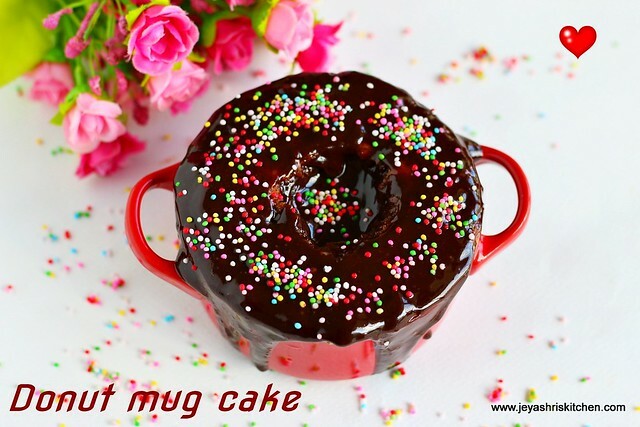 Donut mug cake is an easy microwave mug cake recipe topped with chocolate ganache. 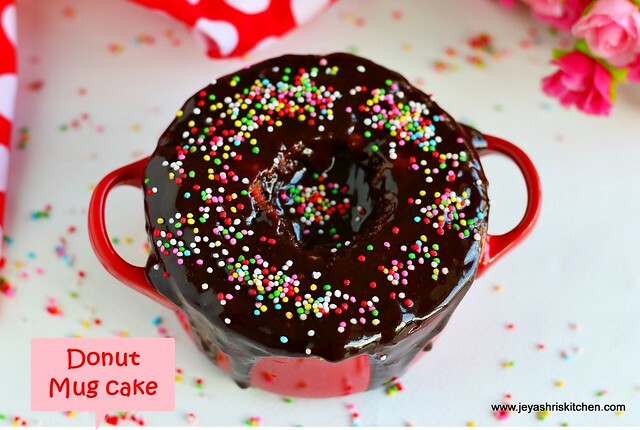 This is perfect dessert for a valentines day celebrations. Valentines day is more special to us as it is out little Prince Varun's birthday too. I have planned to make eggless doughnuts for him but i had to attend to few other work, which was not planned before. So made this donut mug cake for valentines day and an eggless double chocolate chip cake for his birthday. I decorated the cake with whipped cream icing and m and m candies. Will surely post the recipe of doughnuts soon. On this occasion of Valentines day, i extend my love to all my dear readers, who all make this journey so complete. Celebrate love. In a bowl add all the ingredients under the ingredients for the cake. Mix well into a smooth batter. Grease a microwave safe mug | cup and pour the batter into it. Microwave for 1 min and 30 seconds. Mine took 1 min 45 seconds. I microwaved in high power. Allow this to cool. Check by inserting a tooth pick in the center. If it comes out clean then the cake is done. Heat the whipping cream till rolling boil. Place the chocolate chips in a bowl and add the hot boiling cream to the chocolate bowl. Mix well into a smooth paste using a spoon. The chocolates will melt so easily after adding the cream. Using a spoon or melon ball scoop, take out a small portion of the cake . Do not do it too deep. Just slight deep is fine. Level it well with the back of a knife. I used the back of the melon scoop itself. Even a roll pin which we use for roti will work. Pour the chocolate ganache into the dent and spread it all over the surface of the cake. Even it over flows also it's fine. Sprinkle some rainbow sprinkles on the top. Allow this to set for 2 minutes. You can serve the mug cake without making the dent and the ganache. You can just add some powdered sugar and cinnamon and serve immediately, once it is done. Do not microwave for too long and it will make the cake hard.